A Funeral Liturgy will be celebrated by The Very Rev. Paul R. Wolensky on Tuesday, at 12 noon in St. Vladimir Ukrainian Greek Catholic Church, 70 Zerby Avenue, Edwardsville 18704. Viewing for family and friends will be on Tuesday, 10 am until time of Liturgy. Interment will follow in SS Cyril & Methodius Cemetery, Berwick. In lieu of flowers, Memorial contributions are preferred for St. Vladimir’s Mortgage Debt, 70 Zerby Avenue, Edwardsville, PA 18704. Brother Jon Miknich (Rickey), 70 of Berwick, died Thursday night in Geisinger Medical Center, Danville, from complications of leukemia. Born in Berwick, he was the son of the late Michael and Helen Miknich. 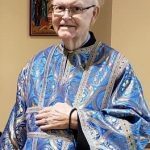 He was a 1968 graduate of Berwick High School and was educated as a Byzantine Franciscan Friar at St. Basil The Great Seminary, Stamford, CT. 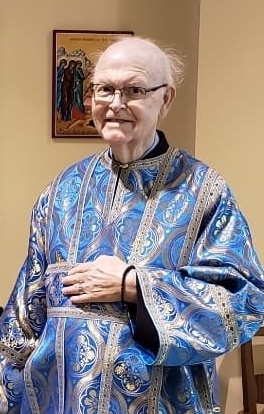 Brother Jon served at St. Vladimir Ukrainian Greek Catholic Church, Edwardsville and SS Peter & Paul Ukrainian Greek Catholic Church, Wilkes-Barre, until a few weeks ago. He is survived by his God Son, Brian Rubenstein, who was like a brother to him, two brothers, Barry Chura (Pamela), NY, Michael Miknich, Berwick, one sister, Michelle Stachak (Brian), Nanticoke, nieces, nephews, cousins, and most special cousin, Sharon Miknich, Bloomsburg. A Funeral Liturgy will be celebrated by The Very Rev. Paul R. Wolensky on Tuesday, at 12 noon in St. Vladimir Ukrainian Greek Catholic Church, 70 Zerby Avenue, Edwardsville 18704. Viewing for family and friends will be on Tuesday, 10 am until time of Liturgy. Interment will follow in SS Cyril & Methodius Cemetery, Berwick. In lieu of flowers, Memorial contributions are preferred for St. Vladimir’s Mortgage Debt, 70 Zerby Avenue, Edwardsville, PA 18704. Arrangements by the Edward J. Chomko Funeral Home & Cremation Services, 262 Railroad Avenue, West Scranton.